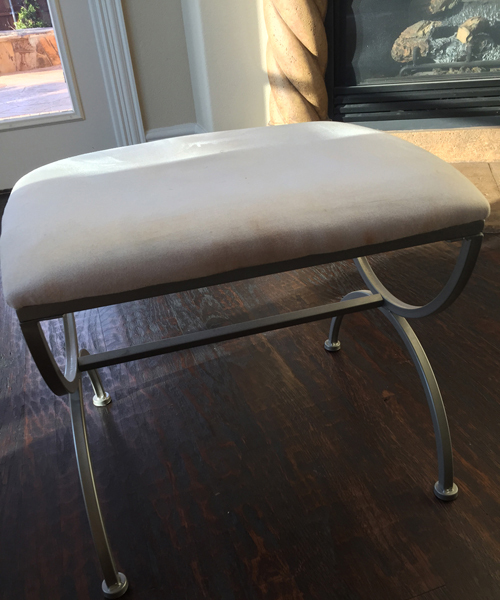 DIY Vanity Stool Makeover — THE FAUX FANCY. I'm not sure why it took me this long to do this. Well, I suppose because there's so much remodeling I want to do in our bathroom, that having a pretty vanity stool was the least of my concern? Let's just go with that. If you know me, you know I have to fight my urge to paint every corner in my house gold, so it's no surprise that this piece would be gold. I've also been mildly obsessed with the Thaibaut Tanzania wallpaper I've seen all over Pinterest, so I was so excited to walk into my local Hobby Lobby and find fabric in an identical print. Anyway, this project (like most of the ones I commit myself to) took little time. I was able to cook dinner between the paint drying and finish it in under an hour. I purchased my stool over two years ago, and as you can see, it was practically begging me for a refresh. Two year old stool from Bed Bath & Beyond. All you need is spray paint in the color of your choice (gold, obvi), a heavy-duty staple gun, fabric and scissors. I started by disassembling the stool which required all of unscrewing about 6 screws. Then I sprayed the base. It's true, Rustoleum has the best gold spray paint I've used...and I've used more gold spray paint than I'd like to admit. Once the base was dry, it was time to reupholster the seat. This was probably the most time consuming part because the corners were a problem child. I had to play with them a while before they looked presentable. For the rest, I just pulled tightly and stapled - while paying attention to the holes so I was still able to screw it back onto the legs. Once that was done, I simply screwed the seat back onto the base and voila, magic. I'm slightly obsessed now. I've been searching Craigslist like a crazy person trying to find pieces I can reupholster.